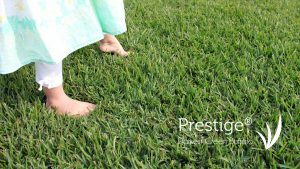 Prestige® Buffalo lawn offers homeowners a beautiful, no-fuss lawn that maintains a deep, dark-green lush colour year-round. With its outstanding winter colour and its cold, drought and shade tolerance, it is easy to see why Prestige® is one of the most popular lawn types along the eastern seaboard of Australia. Prestige® is bred from the world’s most popular Buffalo – Palmetto® – and delivers many of the same outstanding traits that make it advantageous for residential back and front yards.